I caught your article and thought I would reply, but want it known there are many people that were closer to this project than me. Some 38 years ago I was a friend of the owner and did the electrical wiring on the ‘James Garner Special' as it was being assembled. The comments below are my best recollection, personal observations or what I remember being told by the owner. See? 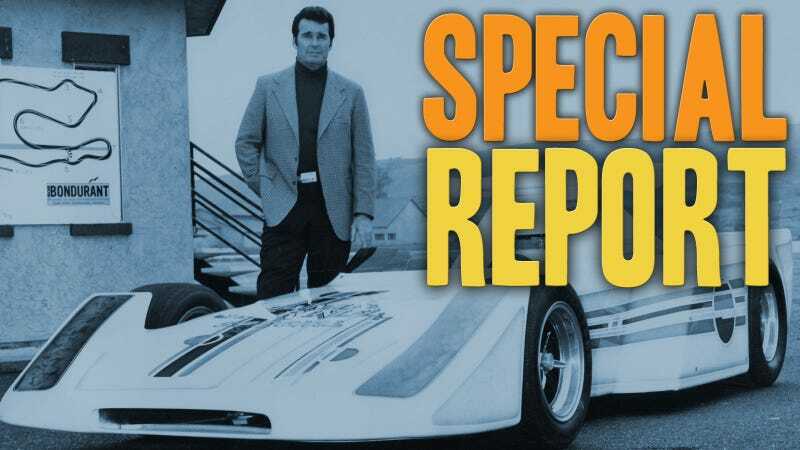 Remember that article we ran a bit over a week ago about the amazing four-seater Indy car James Garner used to own? Well, Pete Phelps saw the article, and, thanks to the magic of the Internet, we now have his personal recollections of the building of the car (Mr.Phelps did the wiring– I've been stranded by bad wiring enough to have lots of respect for that job), and we learned the car's actual name: The James Garner Special. As you wrote in your article, this show car was built around 1974. Mike Haas of Concord California was the owner and builder. I met him through Hot Rod activities in Concord and the Oakland Roadster Show. Mike built show cars and painted rods at the time and my sense was that Mike built the car to tour the ‘U.S. Show Circuit'. The race car chassis was stretched to accommodate the outboard seats as I recall. The engine was a small block Chevy. The body was a work of art; most all corners of the panels were formed in a radius. The workmanship was beautiful. After it's assembly (sans paint), I was asked to wire the car at his garage. While there one evening, racing driver Bob Bondurant happen to drop by to check out the car's progress. Later, Mike told me the car was taken to Sears Point Raceway in Sonoma (now Infineon) where Bob put a couple of (think easy) laps on it after his shop setup the suspension and got it road worthy (Bob Bondurant was running Sears Point at the time). I believe Bondurant was the link to tie James Garner to Mike Haas, resulting in Garner's name on the front of this unique show car. What better way to attact show promoters to the car than to tie it to a racing celebrity. Mike once told me of a ‘road test' in the "James Garner Special". He, his wife and another couple jumped in and motored out of their subdivision, exhaust as in the photos, down a secondary road right in town and back without incident. He commented while it was a thrill to make that run, he doubted the ladies would ever ride in the car again. The sticky race tires pelted them with small rocks while they were sitting in the outboard seats! After its exposure in the S.F. Bay area, Mike told me the car was loaded in a big rig trailer headed east to join the show circuit. That is the last I heard of the car until I read your article. After the project was completed, I was given these photos from a professional shoot at Sears Point to remember the car with Garner dressed to ‘the nines' and a lovely (unknown) model in a ‘eye catching' outfit. Hope this helps you to fill in some of the history, keep up the great work! Thanks again, Mr.Phelps. That original paintjob looks pretty incredible, too.